The Egyetemi Templom was made after the fall of one of the biggest ruling empires in Budapest. 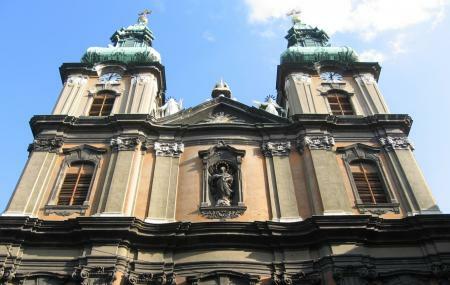 After the fall of the turks, the particular spot was chosen to build one of the most beautiful churches in the city of Budapest. The place was initially reserved for a mosque but soon after the Turks left, the church was created here instead. The paintings of the ceilings are made by Johann Bergl from Bohemia and the pulpit was painted by an artist whose name is unknown. There are some beautiful paintings housed inside the church that date back to the 1720s and increase the glory of the place. Seek permission before doing any photography. The opening hours may vary. Ask the authorities about the details. How popular is Egyetemi Templom? People normally club together Semmelweis Museum Of Medical History and Hungarian Academy Of Sciences while planning their visit to Egyetemi Templom. I was staying very close to this church and would walk passed it often, noticing the height and the bell towers but never feeling inclined to go inside. One day the door was open and I was very surprised to see such a beautiful, Baroque Roman Catholic church. The outside belies the splendor within. It is not on tourist sites so is very quite. It's a nice place to take a rest and contemplate. We took goulash soup and asparagus soup and they both were super delicious . The Service was great, and the atmosphere was nice too. Great exterior but closed even on Sunday.